The department of defence has an irrevocable obligation to buy what its minister describes as “a VVIP” jet. That means an aircraft for a Very Very Important Person. But jump to no conclusions as to who this VVIP is. It is not the man who is referred to by his scurrying minions as “Number one”. Oh, no, Defence and Military Veterans Minister Nosiviwe Mapisa-Nqakula told a press briefing. “Buying the VVIP aircraft, we will. But not for [President Jacob] Zuma. 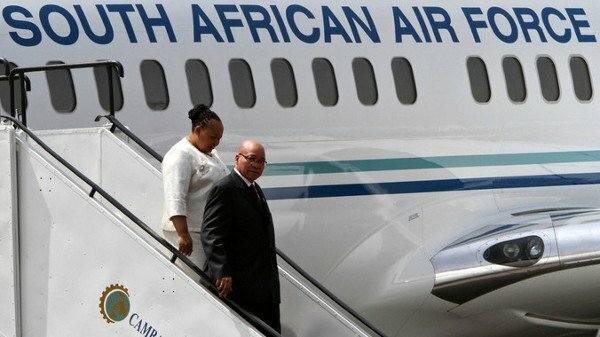 There will be a president after Zuma … [and] the VVIP aircraft will still be there,” she said. Mapisa-Nqakula declined to put a price on the purchase, but said that the VVIP would not cost R4 billion, the figure bandied about by Zuma’s critics. Presumably, however, a VVIP aircraft, because of the additional V, will cost proportionately more than a mere VIP one. For some reason these reassurances have not placated opposition MPs. They harp on the fact that despite the defence ministry being desperately short of money, causing general flying hours to be reduced, flying hours for the VIP squadron – to be renamed the VVIP squadron? – have been substantially increased. These opposition MPs are being churlish. Zuma loves jetting about the world, albeit that his geographical knowledge – until recently he was under the impression that Africa is the biggest continent – remains somewhat challenged. Our president regularly pops off to favourite destinations like Moscow, to do radioactive deals with President Vladimir Putin, and to Dubai, where his mates the Guptas recently acquired a modest $30 million (about R462 million) pad. Also, aside from the practical benefits of a VVIP jet for Zuma, there are psychological and personality factors. It is a sad reality that there are men who, upon reaching a certain age and stage, feel that the one single thing they must have is an open-top sports car. Understand, this has nothing to do with the practicalities of getting from A to B, but rather about status and, sometimes, sexual reassurance. In a similar fashion, but at a more elevated social level, there are those who hanker after their own aircraft. Zuma, despite his self-evident virility, is one of the latter. After all, he is a competitive man. President Barack Obama has Air Force One, immortalised in scores of Hollywood films. Putin has a new matching set of presidential jets, costing more than R20 billion, as well as the so-called “Doomsday Plane”, built to double as an airborne control centre for Vlad if there is a nuclear conflict. Goodness, even Donald Trump, who is merely an aspirational president, has a brand new, customised, Boeing 757, which complete with 24-karat gold fittings costs only $100 million, equivalent to R1.5 billion. And the Guptas, Zuma’s cronies who reputedly have been delegated to deal with the irksome aspects of the presidency such as hiring and firing ministers, have an entire fleet at their disposal. There is the family runabout for journeys between Johannesburg and Dubai, a $60 million Bombardier, as well as an executive jet-leasing company. The Guptas even lease to the South African Air Force when it runs low on planes and pilots, such as when the deputy president flew to Japan recently. Zuma’s son Duduzane, fortuitously is one of the directors, so the Guptas of course cut the presidency a good deal – for the Tokyo trip just R5 million and a shitload of frequent flyer miles thrown in. The presidency already does have its own plane. It’s an older Boeing and in the view of the defence minister has to be replaced because it keeps having problems that might endanger the life of the president. For example, it recently left Zuma “stranded” in Burundi and as everyone knows, being stranded in Burundi is already a fate worse than death. Rapport quotes aviation experts as saying that the presidential Boeing is in good nick and just needs proper maintenance. The Burundi “safety failure” was a minor fuel line leak, which had been quickly repaired. They miss the point. As any ageing man knows, there comes a time when a dun-coloured Isuzu bakkie no longer cuts the mustard. It’s gotta be the red Ferrari. With 24-karat fittings, please. The Guptas will organise the trade-in, no probs.